When you’re spending US$15M to drill a hole, you want to make sure it’s in the right place. In the austral summer of ’05/’06, it was still a year until bits would start chewing through rock beneath the McMurdo Ice Shelf (MIS) in the first phase of the ANtarctic DRILLing (ANDRILL) Project. The international science team was busy wrapping up a multi-season geophysical reconnaissance effort, using multichannel seismic reflection profiling to hone in on the ideal site for the next season’s drilling. Using carefully-positioned geophone arrays and controlled (but by no means insignificant) explosive seismic sources, they remotely ‘imaged’ the sedimentary sequence that has gradually accumulated over the last 14 Ma beneath (what is currently) the McMurdo Ice Shelf. 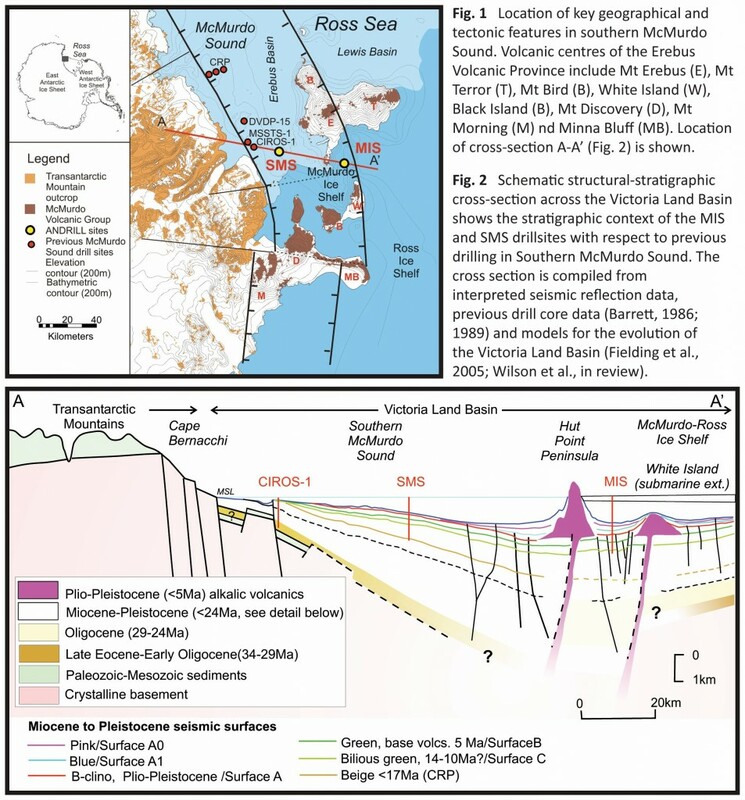 Accommodation space for these sediments was initially provided by regional subsidence related to extension across the Terror Rift, and later, from crustal flexure in response to the emplacement of the Ross Island alkalic volcanics. The ANDRILL MIS core was an unprecedented achievement in Antarctic science: 98% of the 1285 m sub-sea floor drilled sequence was recovered as core, sampling glacimarine sediments that document the Late Cenozoic, continental-scale fluctuations of Antarctica’s ice sheets. Currently at the drill site, the 85 m thick McMurdo Ice Shelf floats above 850 m of McMurdo Sound seawater (which posed a formidable logistical challenge for both seismic profiling and drilling). But as the sediments testify, this area has periodically hosted an expanded, grounded East Antarctic Ice Sheet, and at other times, sea ice-free, open water marine conditions. Following drilling, seismic reflection was again utilised to generate a down-hole vertical seismic profile, to more accurately tie the major lithological boundaries observed in the core to the major, and numerous second-order, seismic reflectors. This allowed the ‘ground-truthed’ geology of the drill site to be extrapolated laterally across the wider study area. Dhiresh Hansaraj was fortunate enough to contribute to both of these exciting field seasons. Interested in geophysics from early in his undergraduate studies, Dhiresh required little persuasion to take up a Master’s project with the ANDRILL team that involved the acquisition, processing and interpretation of MIS seismic data. Following university, he didn’t allow the lack of industry work in Wellington to stop him from pursuing a career in the scientific field he had learned and loved on the ice, and now co-runs his own seismic processing house, Black Mountain Seismic Ltd, which uses entirely New Zealand made software. His experience is a refreshing exception in an industry that generally lures our postgraduates overseas to work for the resource exploration and production giants.